Over the past year, I've really been trying to take care of my skin and listen to what it needs. Just roll with me. My skin is normal/combination and I know that when first delving into the world of skincare, it's easy to take all the products that sound life-changing and slather them over your face which is not always good. With blogging and just generally being inquisitive, I tend to trial a lot of different products. Some new discoveries I've come to absolutely love but in some cases, products haven't agreed with my skin and I've really paid the price for it. So, even though I'm having fun trying out new things, I've been thinking about the products I go back to time and time again because they're such staples for my skin and I know my skin loves them. L'Oreal Fine Flowers Toner | I've been using this toner at night since I mentioned it back in my Boots haul last spring. I picked it up the Dry and Sensitive formula because after cleansing, my skin can get a little dry. I love the consistency of this and a little bit goes a long way. It effortlessly removes traces of make-up and glides across the skin so nicely. It also doesn't irritate my skin at all, something that tends to happen with other toners. This one will be a repurchase for a long time. Cleanse and Polish | I go back to Liz Earle's Cleanse and Polish time and time again and recommend it to anyone that hasn't tried it before. I use it if I've got a full face of make up on or even first thing in the morning. It leaves my skin feeling squeeky clean without stripping it of it's natural oils and making it feel irritated. My skin feels completely refreshed after using this and I'd never be without a bottle of it in my bathroom cupboard. 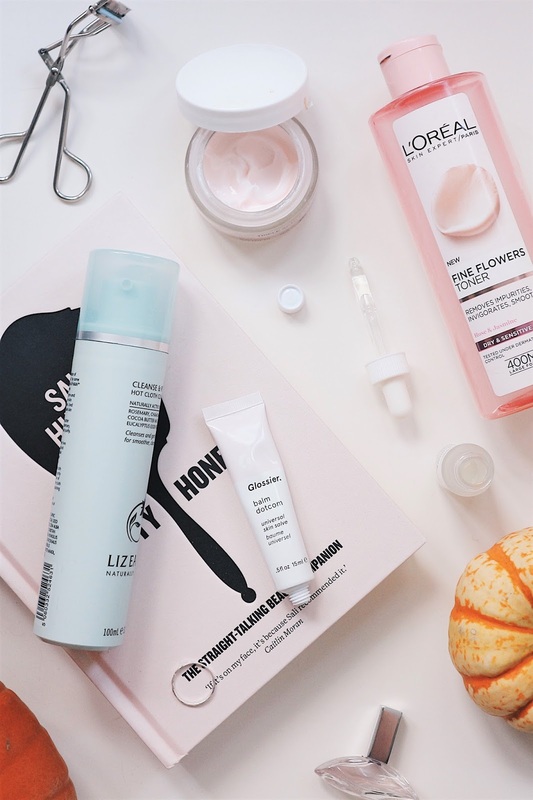 Balm Dot Com | If you've seen my Glossier haul you'll know that this is a recent addition to my beauty collection but one that I know I'll repurchase as soon as I'm out. This balm is ridiculously smooth and melts as soon as you put it on your lips. It seems to keep them hydrated for just as long as my Eight Hour Cream and is a great size to throw in any purse or bag. It's definitely a new staple for me. Triple Active Night Cream | Just like the Fine Flowers toner, I've been using this night cream since last spring and I love it. It hydrates my skin without making it greasy and is the only night cream I've tried that doesn't make my skin tingle after using cleanser and toner beforehand. It's such a nice, thick consistency and the pots last me for what seems like forever - I've even got my other half hooked on it. Along side this, I also use the day cream formula every morning. Salicylic Acid 2% Solution | I discovered this product when I first decided to try out The Ordinary range and I finally understood why it's forever sold out. This works wonders on my red, blemish prone skin by exfoliating the walls of pores (so I read) for visible skin clarity. In a nut shell, it reduces redness, banishes existing blemishes and helps them to stay at bay. A winner in my eyes. There you have it, my current skincare staples. What are yours?